And Again, Greetings Fellow Wisconsinites! We have already introduced Terry Larson, 2018 Candidate for WI State Attorney General. Today, we wish to highlight our candidate for Wisconsin State Treasurer, Mr. Andrew Zuelke. As with all of our email communications with you, we not only invite, but also strongly urge you to share these messages with all of your friends, family, acquaintances, or others who share our political convictions, or who otherwise share a genuine and open willingness to hear and consider the political views of others. Encourage them to join our email list! This post was delivered to our email subscribers on Tuesday, September 11. Click here to be added to our email subscription list, and to receive our Communiqués when they are hot off the press! 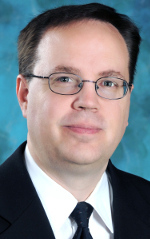 Chairman of the Constitution Party of Wisconsin, Andrew Zuelke ran for Wisconsin State Treasurer in 2014, on a platform of preserving this constitutional Office, of insuring direct voter access to the functions of the State Treasury (rather than hiding them within the State bureaucracy), and thus maintaining responsibility for those functions via elected officers – not unelected, unaccountable bureaucrats. For years, Republicans had worked to empty this constitutional Office of its functions and to disperse those functions throughout the state bureaucracy, in preparation for a call to eliminate it from the Constitution entirely. In early 2018, they did just this. Referring to the Office of the State Treasury as “redundant” and “unneeded” (after having worked for so long to make it that way), they vigorously campaigned to amend our State Constitution, to eliminate this Office from the Constitution, and along with it, direct voter access to the functions of the Treasury, and direct accountability of its stewards to the citizens of Wisconsin. A statewide referendum was held in Spring of 2018, but rather than voting to eliminate this Office, as establishment politicians desired and expected, Wisconsin voters overwhelmingly agreed with Mr. Zuelke, choosing instead to preserve this Office by a considerable margin. Andrew Zuelke is running for State Treasurer again this year, vowing to make this Office a fiscal watchdog and to restore its original duties. His campaign platform was published in late August, and in it details his vision for this Office under his leadership. I will defend and protect the constitutional rights of the citizens of Wisconsin by keeping myself informed of any upcoming legislation which may undermine individual rights or compromise private property (ex. – asset forfeiture laws). 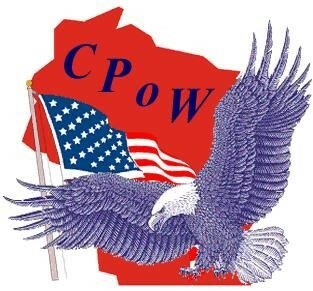 I will uphold and defend the State Constitution and the platform of the Constitution Party of Wisconsin (https://www.constitutionpartyofwisconsin.com). Add the Department of Financial Institutions to the Treasurer’s duties.Right now, this department (https://www.wdfi.org/) is led by a cabinet-level secretary, Jay Risch, who is appointed by the governor. Once again, a powerful accountability agency is directed by an unelected bureaucrat, further consolidating power in the executive branch of our State Government. Be a fiscal watchdog for the taxpayers of Wisconsin.I oppose corporate welfare and crony capitalism. I will use this office as a bully pulpit to speak out against and fight any misuse of taxpayer money. The State Treasurer should be able to conduct budget and agency spending audits. Financial education.There is a woeful lack of basic financial knowledge among the citizens of our state, and our nation. I intend to use my office to institute, support and guide remedies for this problem. I am pleased that our legislature passed the Financial Literacy Requirement (Act 94) in December 2017, which finally requires Wisconsin school districts to adopt standards for the incorporation of Personal Finance lessons/courses in grades K-12. I intend to use the Office of State Treasurer to support these initiatives, and to strengthen them to produce not just sound managers of personal income, but powerfully effective, independent revenue generators – small businessmen and businesswomen – to lead our State in the next generation. I also intend to use my office to educate senior citizens and others about how to save money and protect themselves against identity theft. A separate government agency is not necessary. This task should simply be part of the Treasurer’s job. If you would rather have a true, constitutionally-oriented alternative, instead of having the same two interchangeable parties, with the same party loyalties and the same party enmities, in every elected office in Madison, now is your chance. 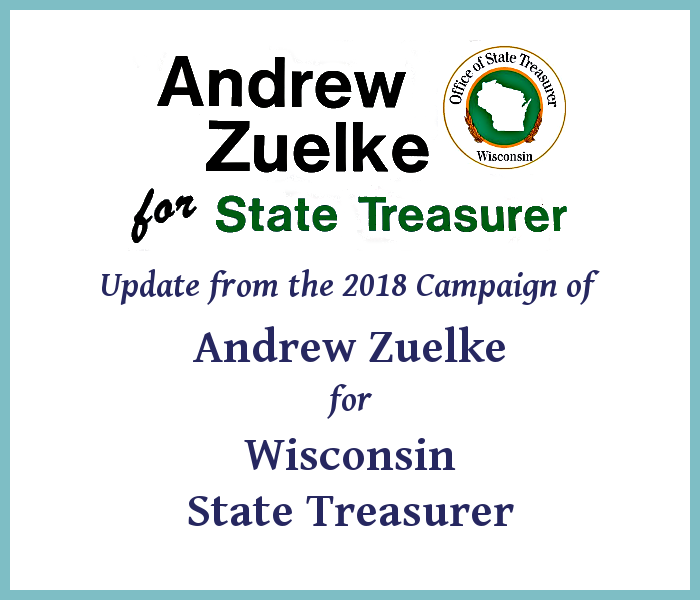 Thank you for reading, and for considering Andrew Zuelke for the Office of State Treasurer. Copyright ©2018, Andrew Zuelke, All rights reserved. Used with permission.